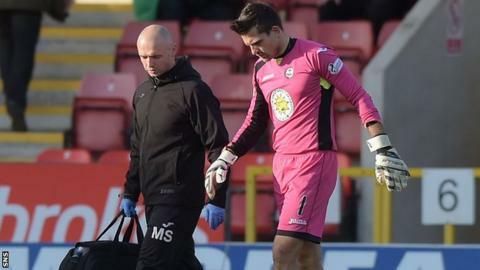 Partick Thistle goalkeeper Tomas Cerny is out for up to six weeks with an ankle injury. Cerny, 30, was replaced by Ryan Scully, 23, after sustaining the injury during Saturday's 1-1 draw with former club Hamilton Academical at Firhill. "Tomas went for a scan the other day and it is looking like anything between four and six weeks," manager Alan Archibald said. "He has been the player of the first quarter of the season for us." Having joined Thistle in the summer following his exit from Hibernian, former Ergotelis and CSKA Sofia stopper Cerny has made 13 appearances for the Jags so far this season. "He settled in really well with a few good clean sheets and some very good saves," added Archibald. "He is a good calming influence on the back four. "We will see when he gets out the boot this Monday. We will assess the ankle and hopefully it is quicker. But they said roughly four-to-six weeks. "It is a blow but it gives young Ryan a chance. He had a good spell on loan at Dunfermline last season so hopefully he is ready to come in and play this Saturday."